“Inside Job” Director Charles Ferguson: Where Are the Criminal Prosecutions for Financial Crisis? | Democracy Now! AMY GOODMAN: The Labor Department has just announced the U.S. economy gained only 69,000 jobs in May and the unemployment rate rose to 8.2 percent. We end today’s show with part two of my conversation with the Academy Award-winning director Charles Ferguson. He first examined the network of academic, financial and political players who contributed to the nation’s financial crisis in his documentary, Inside Job. Charles Ferguson now has a new book out that’s called Predator Nation: Corporate Criminals, Political Corruption, and the Hijacking of America. It’s based on newly released court filings that reveal how major players contributed to the financial crisis. I began by asking Charles Ferguson about a recent comment of Mitt Romney’s. AMY GOODMAN: And let’s follow that up with the interview he did with CNN’s Soledad O’Brien when he talked about not being concerned about the poorest Americans. SOLEDAD O’BRIEN: You just said, “I’m not concerned about the very poor,” because they have a safety net. And I think there are lots of very poor Americans who are struggling who would say that sounds odd. Can you explain that? MITT ROMNEY: Well, you had to finish the sentence, Soledad. I said I’m not concerned about the very poor that have a safety net, but if it has holes in it, I will repair them. SOLEDAD O’BRIEN: Got it. OK.
MITT ROMNEY: The challenge right now—we will hear from the Democrat Party the plight of the poor, and—and there’s no question, it’s not good being poor, and we have a safety net to help those that are very poor. But my campaign is focused on middle-income Americans. My campaign—I mean, you can choose where to focus. You can focus on the rich. That’s not my focus. You can focus on the very poor. That’s not my focus. My focus is on middle-income Americans. AMY GOODMAN: Mitt Romney. Charles Ferguson, your response? CHARLES FERGUSON: Mr. Romney is doing a good job of focusing on the rich, including himself, with a net worth of almost $300 million. Unfortunately, the best way to—in the long run, to help the poor in the United States is to give them fairness and opportunity. And that is not something that Mr. Romney’s policies or the direction of the country have been giving us recently. And his comments about the adequacy of America’s safety net also seem highly questionable. In fact, in this morning’s New York Times, there’s an article about the imminent cessation of long-term unemployment benefits for very large numbers of Americans who have been unemployed for, in some cases, up to four years. So, I fear that a Romney administration would not bring us a solution to America’s economic problems. AMY GOODMAN: And Mitt Romney’s advisers you referred to earlier, as you talk about, for example, Larry Summers and President Obama? Who does Mitt Romney turn to? And also talk about the fact that he is running for president not as the former governor of Massachusetts but as the former head of the private equity firm Bain. That is what he is saying is his—are his credentials for the job. CHARLES FERGUSON: Yes, both disturbing. Glenn Hubbard is one of his principal economic advisers, and Hubbard not only has the major financial conflicts of interest that I detail in the film and also in the book, he also, when he was head of the Council of Economic Advisers in the George W. Bush administration, was one of the principal designers of the Bush tax cuts, half of whose benefits went to the upper 1 percent of the population. So, I do not think that Mr. Romney’s choice of economic advisers indicates his concern for the middle class, needless to say not for the poor. With regard to his record at Bain Capital, the private equity industry, in general, and including Bain Capital, is an industry that is largely unregulated. And although in some cases private equity deals, private equity transactions, have had benefits for companies that are required, for the most part private equity is an extremely efficient machine for making lots of money for private equity executives, in some cases at the direct expense of the companies themselves or the government. One thing that is not widely discussed about the private equity industry is that it frequently depends on hidden subsidies from the government, of the sort that Mr. Romney says he opposes. For example, for-profit—largely unregulated, for-profit universities depend extremely heavily on subsidized student loans, and there have been very widespread abuses of—by private universities that have been owned by private equity firms, including Goldman Sachs. AMY GOODMAN: I want to go to a clip, Charles Ferguson, of your Academy Award-winning film, Inside Job. The clip includes your interview with Scott Talbott, one of the top lobbyists for the Financial Services Roundtable. MATT DAMON: In the U.S., the banks are now bigger, more powerful and more concentrated than ever before. MARTIN WOLF: There are fewer competitors. A lot of smaller banks have been taken over by big ones. JPMorgan today is even bigger than it was before. NOURIEL ROUBINI: JPMorgan took over first Bear Stearns and then WaMu. Bank of America took over Countrywide and Merrill Lynch. Wells Fargo took over Wachovia. MATT DAMON: After the crisis, the financial industry, including the Financial Services Roundtable, worked harder than ever to fight reform. The financial sector employs 3,000 lobbyists, more than five for each member of Congress. CHARLES FERGUSON: Do you think the financial services industry has excessive political influence in the United States? SCOTT TALBOTT: No. I think that every person in the—in the country is represented here in Washington. CHARLES FERGUSON: And you think that all segments of American society have equal and fair access to the system? SCOTT TALBOTT: The—you can walk into any hearing room that you would like. Yes, I do. CHARLES FERGUSON: One can walk into any hearing room. One cannot necessarily write the kind of lobbying checks that your industry writes or engage in the level of political contributions that your industry engages in. MATT DAMON: Between 1998 and 2008, the financial industry spent over $5 billion on lobbying and campaign contributions. And since the crisis, they’re spending even more money. AMY GOODMAN: That was Matt Damon, the actor, narrating the Academy Award-winning film, Inside Job. Charles Ferguson directed that film and then went on to write Predator Nation: Corporate Criminals, Political Corruption, and the Hijacking of America. Take the lessons we learn from Scott Talbott, Charles Ferguson, to what we’re seeing today, for example, with Jamie Dimon and the $3 billion loss at JPMorgan Chase. Who has access? Who doesn’t? His lobbying, for example, JPMorgan Chase and Jamie Dimon, against the Volcker Rule and what this all means? Is it strong enough? CHARLES FERGUSON: The fierce lobbying about the implementation of the Volcker Rule is yet another example of this phenomenon. The banking industry, including and frequently led by JPMorgan and Mr. Dimon, have spent enormous sums of money to push back against strong implementation of the Volcker Rule and other aspects of even the relatively weak regulation embodied in Dodd-Frank legislation. And Mr. Dimon repeatedly has said that he doesn’t think that such regulation is required. And indeed, one of the most astounding things about JPMorgan’s recent loss is that regulation is still sufficiently weak that we don’t know what that trade actually is. We do not know the details of that transaction, because they do not have to be publicly disclosed. It has been said by people who apparently do know something about the transaction that if the situation in Europe worsens, the losses could extend upwards of $5 billion. And this is a loss that occurred in a relatively forgiving economic environment, at least in the United States, and in a bank that is widely regarded, probably correctly regarded, as the best-run bank in the United States. So, it doesn’t give one a great deal of security about what could happen if we have another financial crisis and what could happen in other less well-run, less financially strong banks. AMY GOODMAN: You talk about the crisis in Predator Nation being not just, you know, a Republican affair or a Democrat affair, it’s a bipartisan affair. Talk about the role of Democrats in all of this. AMY GOODMAN: That was under Clinton. CHARLES FERGUSON: Yes, under the Clinton administration. And then, in the year 2000, also in the Clinton administration, the Commodity Futures Modernization Act, which actually banned regulation of all so-called over-the-counter derivatives, including the credit default swaps and many other instruments that were at the heard of the 2008 crisis. To his credit, President Clinton has actually publicly stated that he now regrets having passed that law. But it was definitely championed by major fractions of the Democratic Party and policy leadership. And then, of course, we’ve seen in the Obama administration very little reform and no criminal prosecutions, and the appointment of a very large number of Wall Street executives to senior positions in the government, including some people who were directly responsible for causing significant portions of the crisis. AMY GOODMAN: You also talk about how the once-revered figures Alan Greenspan and Larry Summers have simply become courtiers of the—to the elite. CHARLES FERGUSON: Unfortunately, I think that’s an apt description. Of course, Alan Greenspan was a private economist before he went into the government, and had even taken money in the 1980s for lobbying on behalf of savings and loan executives who were later sent to prison, including Charles Keating. Larry Summers was first an academic and actually did not start working for the financial sector until after he left government for the first time, when he was president of Harvard and then subsequently a professor at Harvard. But he has consistently favored the financial sector’s interests in all ways, and now he has made, by this point, tens of millions of dollars from the financial sector. AMY GOODMAN: The issue of regulatory capture—you talk about the importance of more regulation, but what about the—that revolving door between business and regulators? CHARLES FERGUSON: Very important problem. Difficult to address, but not impossible. I think that one very important measure that would be very beneficial would be raising the salaries, dramatically raising the salaries, of senior regulators and senior civil service personnel responsible for economic policy. In some other nations, senior regulators are very well paid, hundreds of thousands, even in some cases over a million dollars a year. And if that’s the case, their temptation to favor banks, to go to work for banks, is of course much reduced. And I think that increased pay for the public sector should be accompanied by much stricter restrictions on what people can do after they leave government. Of course, people should be permitted to work in the private sector, but, for example, a five- or 10-year ban on lobbying would, I think be a very beneficial thing. AMY GOODMAN: Charles Ferguson, director of the Academy Award-winning documentary Inside Job. His new book is called Predator Nation: Corporate Criminals, Political Corruption, and the Hijacking of America_. 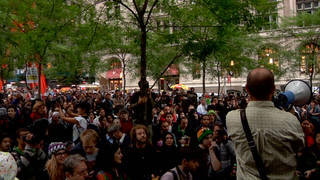 You can go to our website at democracynow.org to hear wall”>part one of the interview. Tune in next Wednesday for our interview with economist Joe Stiglitz and our coverage of the recall election of Wisconsin Governor Scott Walker as he competes for the governorship with Milwaukee Mayor Tom Barrett. We’ll also be speaking next week with Congressmember John Lewis and be covering the verdict in the Mubarak trial in Egypt.